Welcome to our 3BR/2.5BA townhouse, conveniently located close to everything. We’re in a private gated community that’s near lots of fabulous local landmarks and just a short 20-minute drive to downtown! Can’t decide which fantastic Nashville landmark to explore first? There’s lots of common space where you can gather your group and make a game plan. The homey living room seats 6 and features a 50" flatscreen TV with DVD/VCR player and a DVD collection to fill your down time. The sun-filled kitchen and dining space, with gleaming hardwood floors and back deck access, is another excellent gathering spot. Enjoy your meals at the dining table with seating for 4. Another 3 people can sit at the kitchen breakfast bar while enjoying coffee from the Keurig coffeemaker! And the open kitchen has stainless steel appliances and lots of counter space: perfect for the chef in your group. Our house sleeps 6 guests between 3 bedrooms. The master features a queen-sized bed, luxurious dressing area with a huge full-sized mirror, flat screen TV, and en-suite bathroom. The 2nd bedroom has a queen-sized bed and a workspace for business travelers or writers. And the 3rd bedroom has a full-sized bed. You’ll also find lots of outdoor space here. Grill dinner on our sprawling back deck and enjoy your meal at the outdoor table. Or run barefoot in the grass—who knows what your vacation might bring! Besides being only a 7-minute drive from The Hermitage, Andrew Jackson’s historic home, and 20 minutes from the Grand Ole Opry and Opryland, golfers will love that we’re just 5 minutes to the Hermitage Golf Course, home of the LPGA Sara Lee Classic and top-ranked courses. Feel like seeing Nashville from the water? Take a cruise on the Cumberland River or rent a boat and explore Old Hickory Lake or scenic Percy Priest Lake. Enjoy nearby walking/biking trail that wind through downtown Nashville and nearby communities. And there are lots of food options nearby. Grab breakfast at Old Hickory Bistro, a 5-minute drive away, or the pizza and chocolate bread pudding at Gondola House, a 9-minute drive. Ihop, Chili's, Buffalo Wild Wings, Jet's Pizza, and much more are just up the road! all of downtown Nashville awaits you—just a 20-minute drive away. When you book, we will send you our mobile app with directions, lock code, and instructions. We’re available 24 hours a day with live help. Awesome stay!!! This place was amazing! The booking process was easy and the owner was great to work with. She thoroughly reviewed everything with us before we traveled. She provided so much information about the property, we felt as if we had been there before! The layout of the house was open, very warm/welcoming, and immaculate! We traveled to Tennessee with some friends to celebrate our wedding anniversary! We were short drive from all of the attractions that Nashville has to offer! We would definitely stay here again and highly recommend this to everyone! Fantastic place! Very clean & up-to-date comforts! We thoroughly enjoyed this property! The atmosphere, amenities, cleanliness and up-to-date comforts along with modern décor made for a relaxing and pleasant visit to Nashville. Beautiful condo and welcoming neighborhood. We gladly recommend this property! We arrived on a Saturday and were fortunately able to check in early to the rental. Everything was very clean and was represented EXACTLY as pictured and described, which was very important to us. 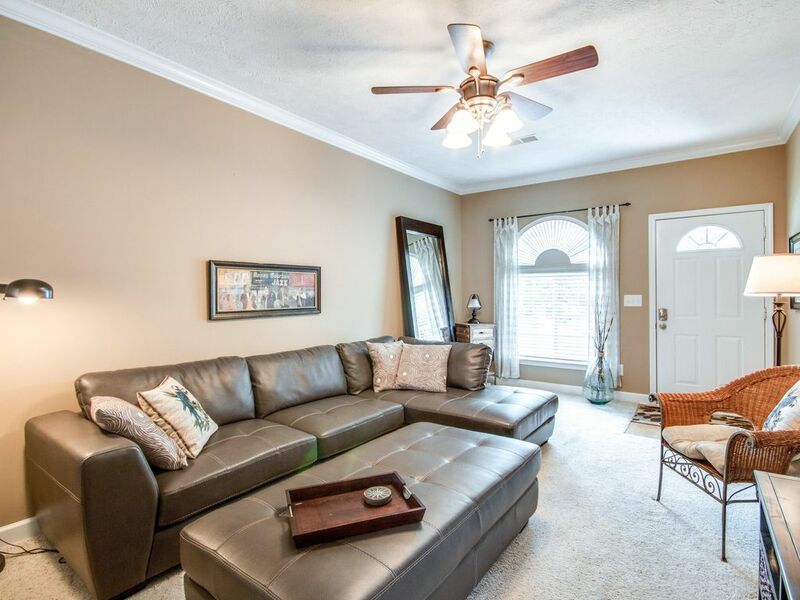 Even though the location of this rental is a good bit away from downtown and some of the main attractions in Nashville (you will definitely need a car), the neighborhood was very quiet and secure and conveniently located near lots of shops & restaurants. This is a very nice safe place to stay when visiting Nashville. Don't be fooled by the travel time on your GPS easy no hassle drive to downtown! Our family drove in from Houston for our first Nashville experience. The townhouse was very nice and clean and in a very nice, quiet gated community. It was spacious and clean and gave us all plenty of room. We didn't spend much time in the townhouse because we were out exploring and having a great time; however, it was a great location for our launching pad every morning and our retreat in the evening. This is quiet location, so I would recommend this property more for a family and not necessarily for a group that wants to stay up late and party in the townhouse. The General Lee Showboat, Grand Old Opry, an awesome German Restaurant, a pedestrian bridge and park, Opry Resort Hotel and Conference Center all conveniently close by. (10 min and approximately a 20 minute drive to downtown).